Our workout of the week series delves into the newest fitness trends, classes and technologies and explores the latest wellness movements to help you get ship shape for your next superyacht vacation. This week Zoe Dickens tries out personal training at Opus in Notting Hill, London. The basics: Founded by personal trainer and keen sportsman David Kingsbury after a hip injury forced him to take a step back and undergo months of physiotherapy, Opus takes a science-led approach to personal training creating tailored programmes to suit the needs of each individual client. Each of the studio’s five trainers has a particular area of expertise, ranging from body aesthetics, reformer pilates and injury rehabilitation to nutrition, pre and post natal exercise and massage therapy, so whether you’re looking to get fit or fix a niggling injury there’s guaranteed to be someone who can help. What’s it like: Before I get down to the nitty gritty of the actual workout it must be said that the Opus studio is a joyous place to work out. The large light-filled space on a peaceful back street in London’s Notting Hill area is quiet, kitted out with high-spec equipment and equipped with all the amenities necessary for those who wish to go straight from gym to office. Full marks so far. Founder and former rugby player David Kingsbury meets me at the door and we immediately get down to the specifics of my training goals. It is decided this session will focus on upper arms and thighs and I am led into the airy training room and directed towards the reformer pilates machine. 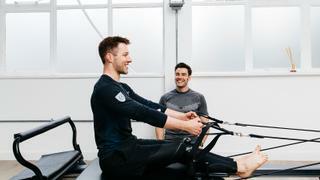 New to me but not to Kingsbury – who racked up an impressive 3,500 hours of reformer pilates training at one of London’s top studios before opening Opus – I am given a number of exercises which involve combining the machine's sliding bed with weights and resistance bands to target specific muscle groups. 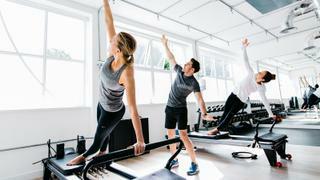 These exercises are gentle but effective and Kingsbury explains that, in this way, reformer pilates can be a hugely beneficial tool in fighting injury and strengthening muscles to soothe aches and pains. In fact, alongside the private personal training clients, many of Opus’ users are referred by GPs for this very purpose. After the reformer pilates we move on to more familiar functional training using a TRX machine followed by tricep dips and a few weight lifting exercises. Despite the absence of any traditional cardio work, by this time I am a quivering, exhausted mess and relieved when Kingsbury pulls out a mat and tells me it’s time to cool down. As I stretch Kingsbury’s next client walks in and the two reveal an easy rapport, trading jibes over their respective times on that week’s ‘Opus challenge’: a circuit of sprints, squats and press-ups to be done in the fastest time possible with the leaderboard posted on the wall for all to see. This kind of community atmosphere combined with effective training from Kingsbury’s highly-trained team makes Opus an addictive place to workout that I couldn’t recommend more highly. Personal training at Opus starts from £90 per session with group and duo training also available. Visit opusfitness.co.uk.